Indiana is a U.S. state in the midwestern and Great Lakes regions of North America. Its capital and largest city is Indianapolis. Other famous cities and towns include Bloomington, Gary, Ft. Wayne, South Bend, Evansville, Muncie, and Marion. People who live in Indiana are sometimes called Hoosiers. Indiana's state bird is a Cardinal. Indiana's state flower is a Peony. Indiana's state tree is a Tulip Tree. Indiana has borders with four other states: Illinois, Kentucky, Michigan, and Ohio. It also touches Lake Michigan; which is the only one of the Great Lakes that is completely inside the United States. One famous attraction of Indiana is the Indianapolis Motor Speedway, which is where the Indy 500 is held every year. The Indy 500 is one of the most famous car races in the United States. The Indianapolis Motor Speedway is not actually in Indianapolis. It is in a town called Speedway, which is completely surrounded by Indianapolis. As well as being home to the Indy 500, there are several well known sports teams in Indiana. Professional sports teams include the Indianapolis Colts of the National Football League (NFL) and the Indiana Pacers of the National Basketball Association (NBA). Colleges and universities in Indiana with well known sports teams include Purdue University, the University of Notre Dame, and Indiana University. ↑ "Population and Housing Unit Estimates". U.S. Census Bureau. June 22, 2017. Retrieved June 22, 2017. ↑ "Lightning bug becomes Indiana's official state insect". 13 WTHR Indianapolis. 27 February 2018. 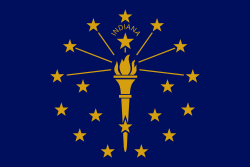 Wikimedia Commons has media related to Indiana. This page was last changed on 13 February 2019, at 17:46.